It is important to give family and friends the opportunity to identify the importance of a report card review in the context of a loving, supportive, and faithful conversation with the student. 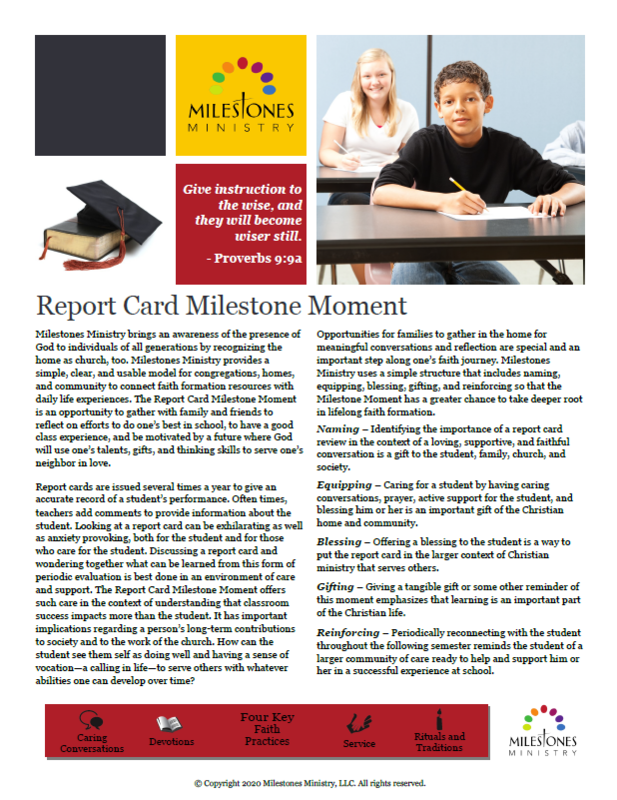 This Report Card Milestone Moment supports this important experience of reviewing report card results, which can be exhilarating as well as anxiety provoking for both the student and for those who care for the student. Providing encouragement and care for a student during report card review by having caring conversations, prayer, active support, and blessing them is an important gift of the Christian home and community. This milestone moment encourages reflection and caring discussion about a student’s efforts to do their best in school, to have a good class experience, and be motivated by a future where God will use their talents, gifts, and thinking skills to serve their neighbor in love. This Milestone Moment includes the Four Key Faith Practices outline which encourages growing in our faith by recognizing the home and family gatherings as church, too. A simple five-step structure is also included to establish a solid base for faith formation. These blank pottery stones are individually hand-crafted and available at a low cost to purchase and gift as meaningful reminders of this Milestone Moment. They can be marked with permanent marker to personalize with a drawing or words. They are wonderful keepsakes to remind the student that God is always with them as they gain in wisdom and knowledge.